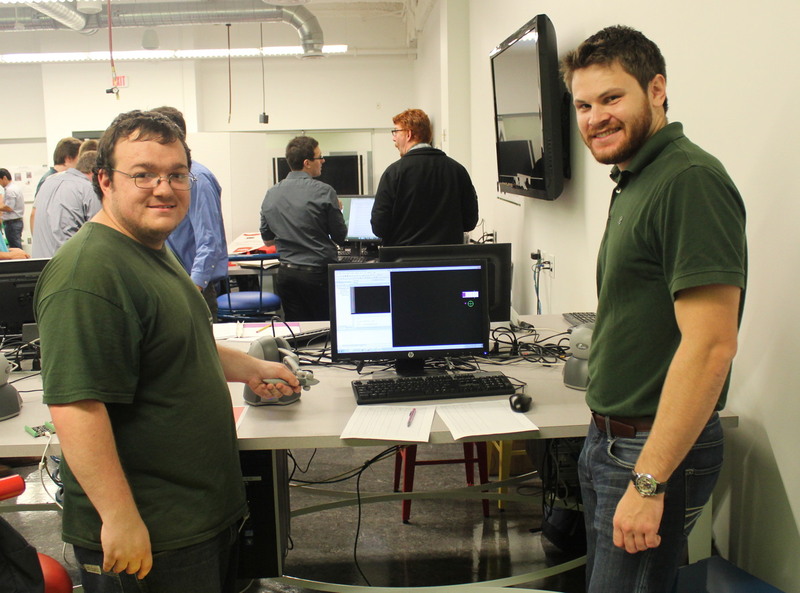 Students from Haptics, Kinematics/Dynamics, and Modern Biomedical Technologies demonstrated their projects, April 25, 2014. Previous research has investigated human-human cooperative point-following, bimanual tasks, and human-robotic interactions on cooperative tasks. In this project, we investigated human-human cooperative point-following with an additional component of matching set forces through a variety of paths. We wanted to find out how this additional component affected users' ability to follow the target, while also determining new challenges caused by this additional component. The results showed that the force requirement made it more difficult than expected to follow slower, simpler paths. Faster paths were affected less. We also found that higher forces were found to be more difficult and that it took time for subjects to adjust to new target forces. More information can be seen here. Last modified on Apr 30, 2014.